I had that and changed it because I was second guessing myself D: But thanks for letting me know, the fix has been made. I like where you’re going with the art! Kind of sad that you can see what the past was saying, knowing what happened right after. Seriously Mr. Scotticus-Type-Person, you indeed push yourself each and every update. And not just with the art, the story as well. cue shark-sword wake up call. ready… WACK!!!!! Wow, this was awesome. It broke my heart but this is a great page. Well done! OMG… I just felt a knife stab my in the gut with the last panel. Absolutely love the wings affect That the shattered wall creates in the last panel. Really made the picture. The shattering effect is well-done! Oh man, that’s such a crazy cool effect in the last panel! I’m loving Scout Crossing more and more with every panel. You’re quite amazing, Scott. Absolutely love it XD. Can’t wait for the next one. Dude if you made this into a cartoon, I would watch it so hard Scout would press charges, and Penny would get a restraining order, but I’m sure Finn would love it, and Ruggles would punch me in the face for making him mildly discomforted. Love that. Loving that stuff, you know? Love it. All the characters in one post, phew! EXCEPT THE BIRD! Love that bird. Lovin it, just real deep down digging it all. I Love that Bird! I have to say this comic makes me so happy every time a new page comes out! I can’t wait for the next page, every time! Ok, I absolutely love the ink in this comic, Wish I had some ideas like this for my own sleeve, but I cant think of anything xD! damn, Keep up the good work! Go back to where we are first introduced to Fin. Read through to today. Marvel at progress in your artistic technique. Aww, poor Chance. Hes dead again. Poor FINN! Hes SOBER! Once again, I have caught up with your comics. Ha ha! Anyway, I love the artwork, and what caught my eye this time, was the single feather floating past Scout’s face. Amazing. …5 years ago. I am 100% sure he meant this exact day. Well done, Sc0tticus (Scott? ), well done. DAMN that is an cool shark. Not only is it a bludgeoning instrument, you can also emotionally violate your opponents before having your shark-sword eat/crush them. At the risk of sounding repetitive: Best. Flashback. Ever. This is beautiful. I just discovered it today, and your story and characters and just plain old beautiful. 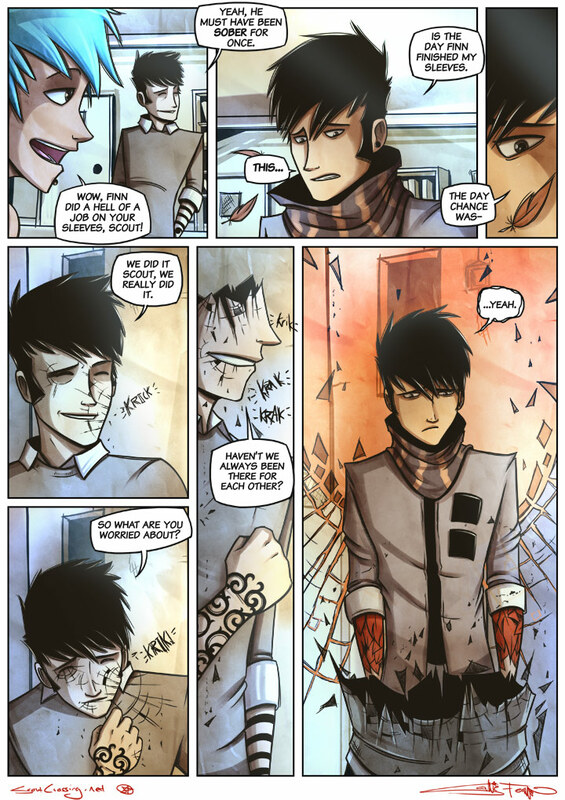 I love how his brother shatters right in front of him and behind him his surroundings shatter along with his brother. I think it’s a really great way of showing how his brother was his world or was a huge part of his world. Wow, last frame is absolutely incredible. Not only did Finn hit him hard enough to launch him into a flashback, he hit him so hard he can’t hold a flashback for more than like two minutes! Hey scotticus, do you have a ladyfriend who is a redhead with a lip piercing, or is that just your thing? Amazing stuff. Just started reading from the first one and I love it. Liking the artwork all the way through and excited to read more of this.